This kinjal-style (or kindjal) sword is of Ottoman Turkish manufacture, and most probably has its origins in north-eastern Turkey. The form is based on the kinjal knife of the Caucasus, and most particularly the qama of Georgia. The blade is broad, double edged with almost parallel sides that eventually meet in a sharp point. The blade is of finely patterned wootz damascened or watered steel with two lines of Arabic script overlaid in gold to either side (partly worn). 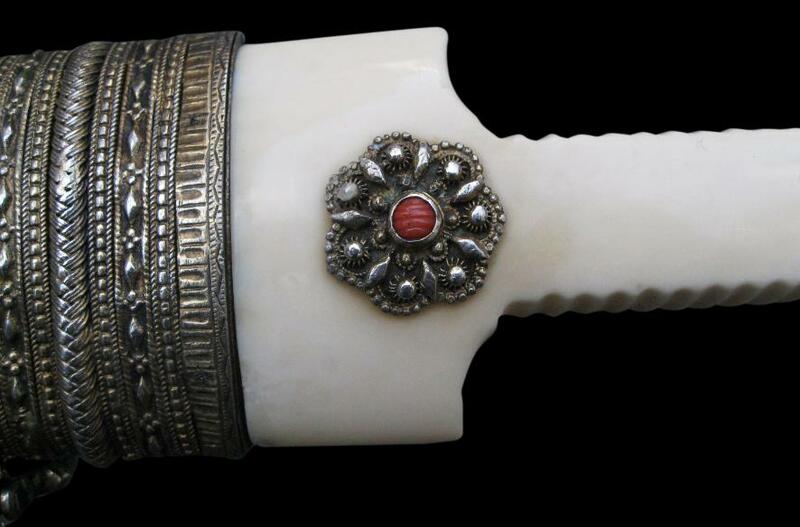 The hilt, of a single piece of cream marine ivory, is straightened in the grip although cut with serrations for better ease of handling, and with a broad curved pommel. It is decorated to one side with two silver-gilt plaques each with a central piece of carved coral cabochon. 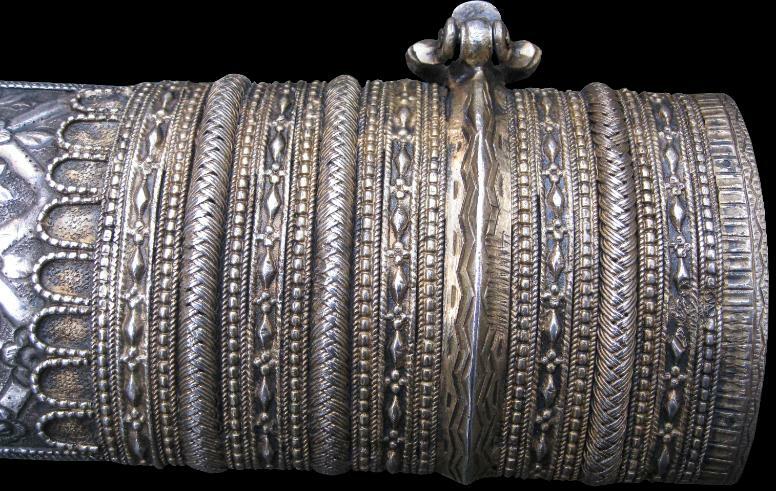 The scabbard is of meticulously worked silver. The upper section, in silver gilt, has multiple bands of beaded, plaited and filigree work. The middle section is of Turkish fish scale design on one side, and with an interlocking flower trellis motif on the other. 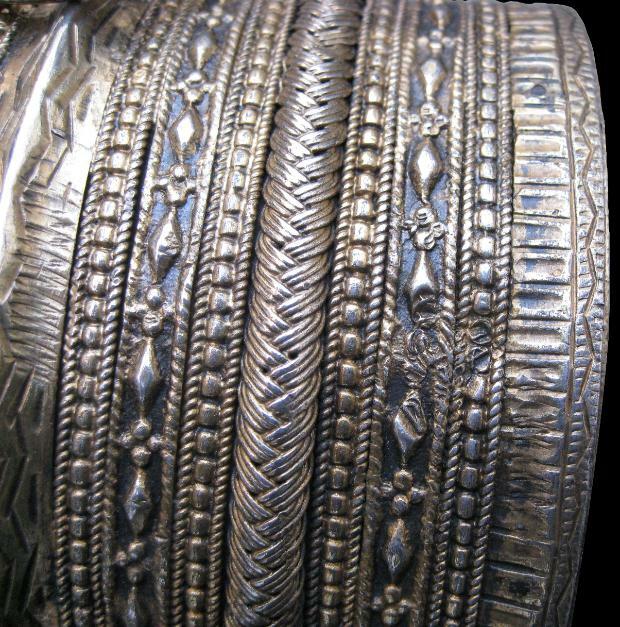 The lower section, again in gilt, is worked to give the appearance of tight twisted wire bands, narrowing to an open-work foliate tip. 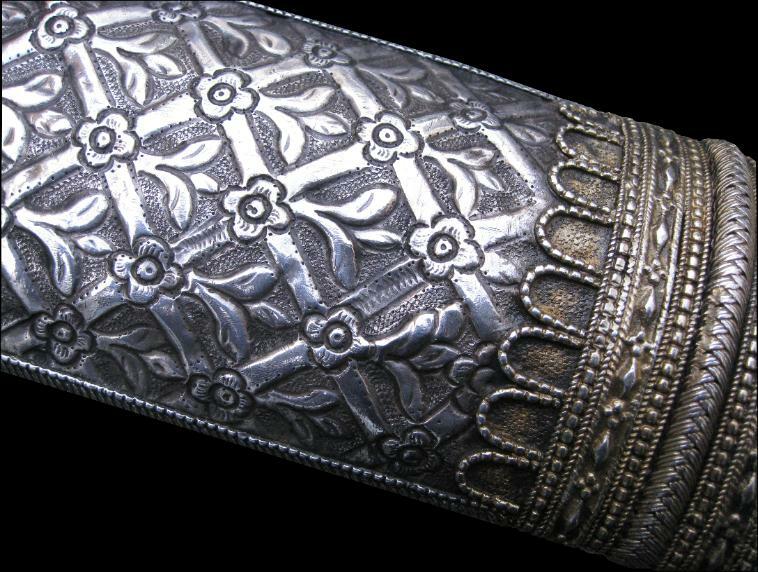 The scabbard is stamped with an indistinct tughra and has associated ‘zig-zag’ assay etching. kinjal overall, and shows the influence of the Ottoman empire’s outer provinces on Turkey itself. Apart from the rubbing to the inscription on the blade, the condition of this sword is excellent. The damascene work on the blade itself is of a very high standard. Stone, G.C., A Glossary of the Construction, Decoration and use of Arms and Armour in all Countries and in all Times: Together with some Closely Related Subjects, Southworth Press, 1961. The zig-zag etching typical of Ottoman silver that was properly tested and assayed can be seen here. An Ottoman tughra stamp is visible in this image.